Again, it's been a while. My summer is screaming by (like everyone else) and between necessary house projects and activities for my two other children, my thoughts on Olivia's "summer of weaning" have been swimming around and around in my head, just itching to get out and find their way to you. We had a little bump in the road early in the weaning schedule. As easy as it sounds, it always becomes complex and difficult. As mentioned in a previous post, we met with a Pharmacogenetics doctor and he performed a couple new blood tests that revealed that Olivia lacks the enzymes necessary to break down the Keppra properly (remember.....I have been saying she can't handle it for years). In a nut shell, because she lacks those enzymes, over time she becomes toxic on the medication and it starts causing problems (in her case, more seizures and a host of other serious side effects). The natural response to this is to just get her off the drug, but going too fast has also caused problems due to her hypersensitivity to change. Believe me, if I could just stop it right now --- today --- I would love to but it's just too abrupt for her sensitive.....complex......fragile nervous system. So, for the time being she will be on some of it until we get her completely weaned off. 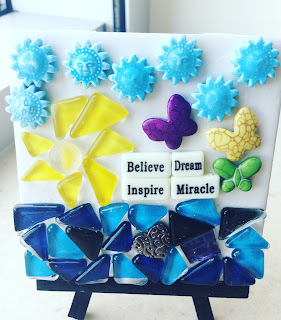 Thought I would share a picture of a tile I made with Lauren during Olivia's stay at Children's Hospital this past May. Over the last several years, Lauren's company during long hospital stays has been a much needed respite from the stressful, long days of unsuccessful seizure control. On this particular day, we walked down to the sibling play area for some distraction. Immediately upon arrival, I laid down on a comfy couch as she sat down to participate in the day's art project. But soon, the begging and pleading for me to participate took hold and I found myself digging through jar after jar of fun, colorful accents to glue to the blank tile that was laying out in front of me. Tired from late night wakings --- I just kind of winged it. As I glance at it today, I realize the symbolism that screams from the artwork I created on that stormy day in May. It conveys the message of our story and my writing on this recovery blog. How is it that I've been able to cultivate this crazy ability to believe in an impossible looking dream? I feel compelled to inspire you to believe in the miracle of healing, rather than in just instantaneous "miracles". I see my heart, once broken and submerged for over a decade in the deep, dark, murky waters of unrelentless chronic illness; finding it's way to the surface where the light is. At the surface, finally able to see true transformation - like the butterfly emerging from it's chrysalis to find it's new life and much needed freedom. I know what you may be thinking - it all sounds well and good....even inspirational, but when is it going to start happening? You know - the transformation I've been believing for. I can write about faith, belief and healing until the cows come home but when will it start to materialize? I kind of set you up in the beginning -- right? I told you that by following our journey you could be witness to a healing miracle.....although I did warn you that it may take some time. I kind of look like a failure. No one wants to look like a fool. Believing in the unseen has it's side effects. I mean, yes, we have seen a hint of it. Like a pinch here, a dash there, but nothing sustainable. A couple weeks/month of no seizures and walking on her own and then a tough patch - ugh. Medicinal Cannabis is an amazing start, but I want more. Am I being unreasonable? Is acceptance of her life of suffering more reasonable? More accepted? Remember this scripture? "Hope deferred makes the heart sick, but a dream fulfilled is a tree of life." Proverbs 13:12 ---- things can appear deferred. Does God always want to heal? Is it God's will to heal everyone? Is it His will to heal Olivia? Those are good questions! Gosh dang it! I needed to educate myself on this subject matter because many I have talked with about believing for this healing have asked me if I know if it's God's will. "Why wouldn't it be? ", was my immediate, knee jerk reaction. I realize it's been a long time (16 years) and it looks impossible, but can't God make everything possible? Am I too naive? Is my thinking too childlike (wait a second, that's the kind of thinking we need for faith - right)? This summer I picked a book off my bookshelf that has been sitting there for about 8 years. "Christ the Healer" by F.F Bosworth. A friend gave it to me and I always had the intention of reading it - and I tried, on several occasions. It was written in 1924 and for some reason each time I cracked it open I became distracted and it was soon repositioned on the bookcase during a bi-weekly clearing off of my bedside table. God's word is the seed. Until the person seeking healing is sure from God's word that it is God's will to heal him, he is trying to reap a harvest where there is no seed planted. It would be impossible for a farmer to have faith for a harvest before he was sure the seed had been planted. 'He sent His Word: it healed them' (Psalm 107:20) The farmer does not dig up the seed, he trusts the seed will do it's work. While on earth Jesus healed them all, not just some. See Luke 4:40, Matthew 4:23-25, Matthew 9:35-36., Matthew 8:16-17, Acts 10:38...I could go on and on. My favorite, however, is Mark 9:14-29 about the epileptic boy whom the disciples could not heal, but Jesus did. I love what Mr. Bosworth says about this scripture I've referred to over and over in my writing. He says, "By healing the epileptic (Mark 9:14-29) Jesus proved it to be the Father's will to heal even this one whom the disciples, divinely commissioned to cast out demons failed to deliver. We see by this verse that it would have been wrong to call in question and to teach God's unwillingness to heal because of this failure on the part of the disciples. Jesus, by healing shows them that the failure proved nothing but unbelief." Paul asked God to remove his thorn and God said "No" ---- three times --- non the less. Those who believe this line of thinking against the ministry of divine healing ---- against the possibility of miracles --- are of the opinion that "God is the author of disease, and that He has chosen some of the most devout of His children to remain sick and glorify Him by exhibiting fortitude and patience." Did God strike Paul, one of His most humble servants with a sickness and then refuse to heal him? Is the very idea of healing not applicable for our day? Mr. Bosworth's intense study of the word reveals that in all the instances the word "thorn" is used in the bible, sickness is not the intended meaning. In one, it referred to the Canaanites, for David it was the son's of Belial and for Paul it was the messenger of Satan. Always a person -- never a disease. This phrase really had me thinking ----- "a messenger of Satan to buffet me". Buffeting. The definition is confirming. Who can't relate to the feeling of being buffeted? Definition - To strike against or push repeatedly. the action of striking someone or something repeatedly and violently. knock (someone) over or off course. To strike against forcefully and especially repeatedly; batter: winds that buffeted the tent. To cause repeated difficulty or harm to (a person or group). To force one's way with difficulty: a ship buffeting against the wind. (Of misfortunes or difficulties) afflict or harm (someone) repeatedly over a long period. That's it! This explains so much, because how in the world could I be so unlucky...so wrong....so, um fooled. God's will is for Olivia to be healed, but who do I listen to? Unfortunately, for the last 16 years I have chosen to listen to experts who fully admit they do not understand why Olivia is having seizures and why a medication does not work. Her neurologist just confirmed this again at her last appointment. Over a million people live with uncontrolled seizures, and that is just the United States. Why on earth did I continue to listen when time after time, year after year the answer's were just as wrong as they were on day one? I chose to rely on them, even when they have no idea what caused her to disappear behind those beautiful blue eyes. Several months ago I had one of the most vivid dreams I have had in a very long time. I was dropping my younger daughter (Lauren Faith) off at an ice skating party with friends. As I looked down at her sitting to my left, she was lacing up her skates. In a moments notice, I glanced to the right and the rink had transformed into a huge bay of water with rolling hills surrounding it with thousands of people sitting together talking. Soon, I too was sitting amongst the masses and all of a sudden a huge "Loch Ness type" monster surfaced in the water and instantly locked eyes with me. Before I knew it, his enormous, long neck made its way toward me as Lauren (faith) clung to me. It was obvious I was his target, and as his huge head came barreling towards me. I stood my ground - but he like, nudged me. Soon, I realized that although intimidating, all this big monster could do to me was this weird nudging thing. He took his nose and came up to me and nudged (buffeted?) me over and over. I felt as though I was in a movie, falling over, holding onto Lauren as he pushed and prodded me across the hill until I finally woke up. It wasn't until I read Mr. Bosworth's book that I realized this was buffeting, and that I have been buffeted for 16 long years. It's clear that these things were allowed, but somehow I can rest knowing that with God's help, I chose to become stronger through each one of these "distresses and persecutions". It's incredible to pull these pieces together and realize that I am stronger because of the constant nudging and it reinforces my interpretation of this dream that all he could do was nudge me. He could not take me out or destroy me. I'm just too fierce for that. So, that got me thinking. I'm only fierce because of Him ---- Paul said it, right? "For when I am weak, then I am strong". Did He allow that junk or did I choose it in some weird way because of the choices I made for Olivia's health.....the advice I took from people I trusted, who ended up being wrong....dead wrong on how to build a healthy immune system. Just like the Israelites, I never questioned my influencers. I blindly trusted them over what God was clearly saying and I wasn't listening because my eyes were focused on them, not Him. Their diagnosis. Their prognosis. Their belief to try the tools from their toolbox over and over again. God enables me to be fierce for Olivia, because His love for her is for good. Like the song Fierce by Jesus Culture teaches. "He wants to answer, He's relentless in pursuit, He rushes in to meet us wherever we are. How could we be lost when He has called us found?" His Love is fierce, and at the end of the day, we all know that it takes someone strong to make someone strong (Proctor and Gamble Mother's Day campaign slogan). It is not God's fault when the physical healing doesn't come. It's man's. It's a hard realization. A friend of mine sent me this comment about God's will in healing from Bill Johnson at Bethel Church, California. "When we submit the things of God to the mind of man, unbelief and religion are the results. When we submit the mind of man to the things of God, we end up with a renewed mind that enhances a life of faith. The mind makes a wonderful servant but a terrible master." I will begin putting the things I learned in my study of God's will into practice. A big one for me is to stop focusing on her symptoms. Each and every one of those darn seizures are meticulously recorded and fretted over. Renewing of my mind is crucial and shying away from observing those "lying vanities" (symptoms) as Jonah did while lying in the belly of a fish. (Jonah 2:8) I want to be fierce. I want to do as much as I can to align my situation with God's will. I can confidently say Thy Will Be Done Lord.